You knew he wasn’t going to return with a bang. That was just never in the cards, no matter how much you idolize the Great Stripèd One. After all those weeks off, after fleeing the TPC in May with a 41 on his front-nine score card, after unceremoniously dumping 13-year caddy Steve Williams – not to mention all his off-course shenanigans, Tiger and his broken-down body were just not destined to be a factor in the WGC event at Firestone this past week. Even if the knee and Achilles were 100%, you just knew his driving and putting wouldn’t be. And they certainly weren’t. Tiger drove the ball like a man behind the wheel of a runaway SUV, and missed putts he’s never missed before, signaling that his era of dominance may truly be over. If you can’t make two-footers – much less ten-footers – you won’t be kissing trophies anytime soon. 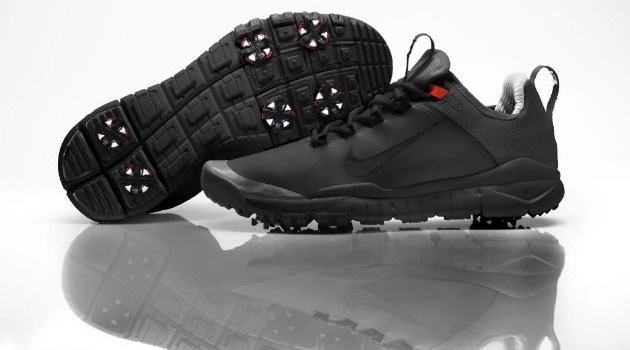 Tiger's prototype NIKE FREE golf shoes. Tiger did earn some attention for his new choice of footwear, though. His NIKE FREE-inspired prototype shoes would’ve been selling by the thousands today if he’d contended. As it is, though, you have to wonder how much better he might’ve played in his old-technology TWs. Nike’s Tobie Hatfield described them as follows: “NIKE FREE is a ‘natural motion’ technology that is designed to mimic and conform to the natural motion of the foot, coupled with the protection and traction of a lightweight performance shoe… The FREE-inspired elements in this prototype model allow greater movement for the front of the foot, increasing stability with mobility. That all sounds fine and good, but what Nike apparently forgot to include in Tiger’s new shoe design was any kind of decent Foot-Wedge™ technology – something that their marquee player could’ve used this past weekend at Firestone. Woods drove the ball all over creation and until a late Sunday surge looked nothing like the world-beater he once was. At least the shoes, presumably, were free. Fortunately, Woods also returned to action sporting a healthy cushion of newly coiffed facial hair, too – something that should come in handy if he keeps taking it on the chin as badly as he did in Akron.